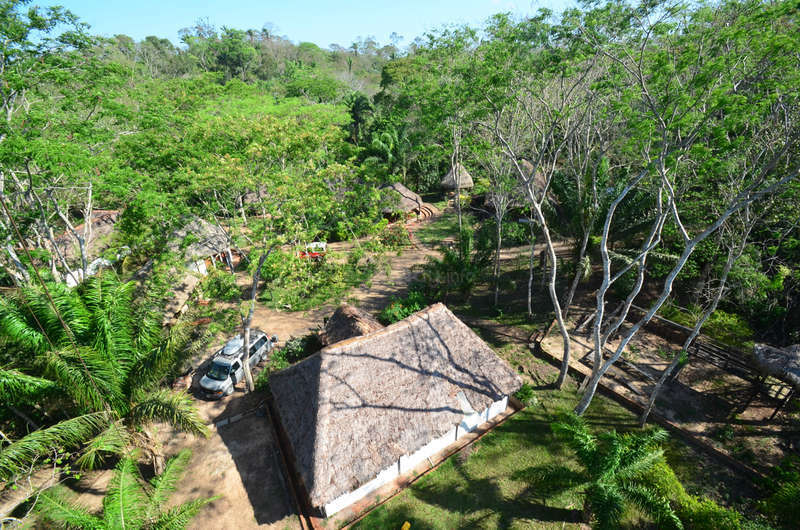 Welcome to our Community Center, a 96 acre plot of tropical forest. We are a non-profit organization dedicated to public health in rural Bolivia. The center offers service learning opportunities for university students from abroad, and multiple day workshops for local village leaders, elected authorities, health care workers, and community health promoters. We are in the early stage of development, therefore our focus is on soliciting groups from abroad, constructing and maintaining the grounds and cabins with cleaning as needed. The center provides lodging in rustic cabins, with homemade meals prepared by local women when groups are present. The outdoor classrooms connect the participants with the natural surroundings. In this initial phase, we are focused on creating model systems for a variety of demonstrations including, water filtration, renewable energy, organic gardens, medicinal plant gardens, walking trails, dry composting latrines, and more. 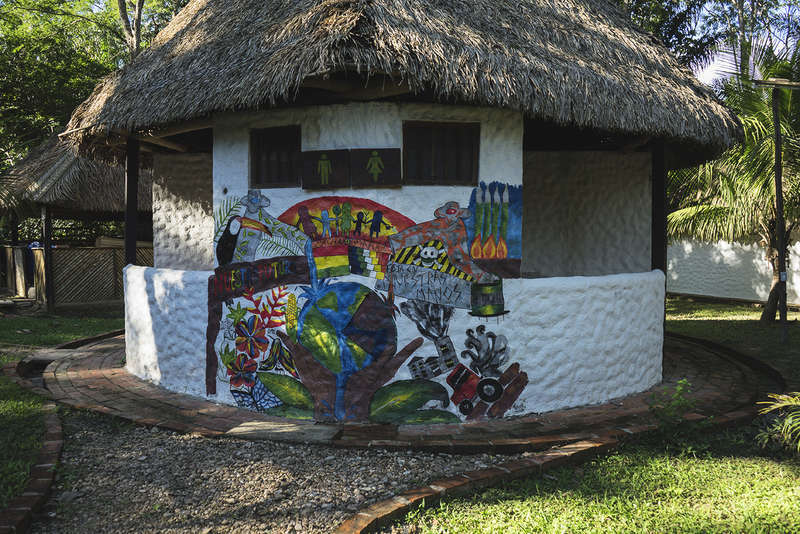 These models will inform and inspire visitors to implement the model in their community, to improve the quality of health and disease prevention in their home and village, cultivating a culture of sharing and collaborating. Bolivia is an amazingly diverse country. 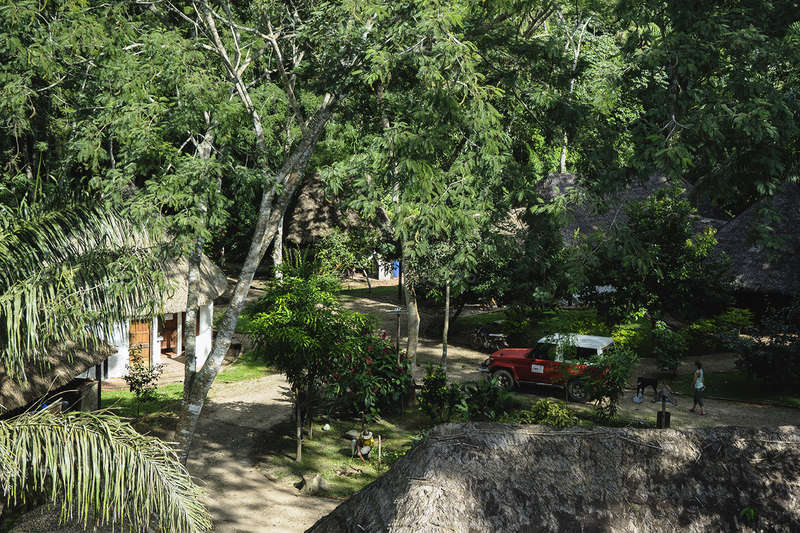 We are located in the tropical forest, surrounded by trees and animals. It is a peaceful refuge where you can reflect and focus, but also continuously learn from nature. The incredible diversity of animals, insects, plants, and trees provides you with the opportunity to observe and learn. Your time here will be filled with opportunities to experiment, build, garden, and put ideas into action. 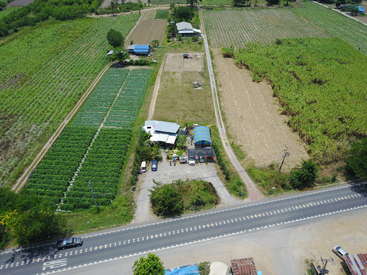 Our project is located 9 km from Buena Vista, a quaint town that has preserved its traditions. If volunteers are interested in participating in community projects (workshops, presentations, dry latine construction, etc) we coordinate with our staff to allow volunteers to travel to sites to see how our model systems are implemented. 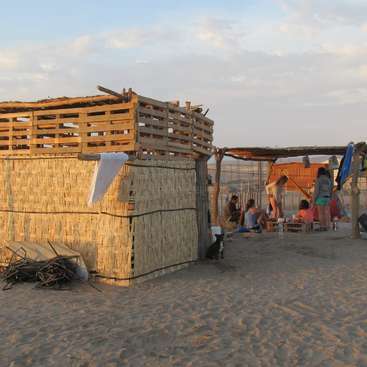 It is a great way to experience rural Bolivia and learn more about our organization. Our international team of volunteers and employees is calling out to the universe for a passionate individual for help on construction and building projects. The ideal candidate would have a masonry and/or carpentry skillset as well as the ability to work individually and with a team. We are open to ideas and creativity and many volunteers have left their impact at our center. Current objectives include: building a brick fire pit with benches, constructing a deck/patio for cabin, setting door frames and hanging doors, building wooden terraces and bamboo archways, etc. Volunteers are invited to help with the following tasks (any combination): gardening (sowing, planting, harvesting, weeding), general maintenance (repairs, painting, power washing), nature path maintenance (raking, clearing branches, repairing bridges), signage, landscaping, building with natural materials, carpentry, implementation of model systems (organic agriculture, water purification, renewable energy), painting, and creative artistic improvements (of existing structures, or using natural materials to create artwork). Preparation for arriving groups may include cleaning of cabins and bathrooms as well as making beds. This workaway experience is for volunteers who are looking for more than just a place to sleep, eat, and work. We focus on teamwork, positive energy, and exchanging/sharing experiences. The days may be long but we all share in the rewards at the end of the day. We rely greatly on the work of volunteers to keep our training center running smoothly. Any cancellations to our agreed upon on volunteering will affect our business. Please consider this before applying. Rustic cabin with electricity, water, bathroom, shower, furniture, bedding, and towel. Access to communal kitchen, fully equipped, and open air dining area. The center is located 9 km from the town of Buena Vista, down a dirt road. It is a fairly remote location with limited access to phone and internet. We arrange transportation to and from town for purchasing supplies. It is a humid, tropical environment with lots of insects and wild animals. We are located near the Amboro National Park, where you can hike along rivers and waterfalls, see tropical birds and wildlife, and camp. Buena Vista is a 25 minute drive away; it is a quaint, traditional town that offers a beautiful shade filled plaza, restaurants (with wifi), bars, a local produce market, locally produced cacao, coffee, and citrus and frequent cultural events. The phone and internet access is restricted (due to available signal, not by choice!). We built a 30 meter high antenna tower to get the phone/internet signal, which works in the reception/office area only. You can purchase a modem stick (Tigo or Entel) for $40 USD to use for your computer, or simply use phone cards for your smartphone. There are motorcycle taxis ($3 USD one way) to and from the town of Buena Vista (9km, 25 minutes). We have a jeep for coordinating trips into town and other communities nearby. I had beautiful 5 weeks in this project and I enjoyed it a lot. Tekoati is a remote oasis without WiFi, so you have lots of time for reading, playing cards, cooking and baking cakes (I loved the kitchen!! ), playing ukulele/guitar and get to know all the amazing people there! Besides working of course, but I really enjoyed it because it is a great… read more community. 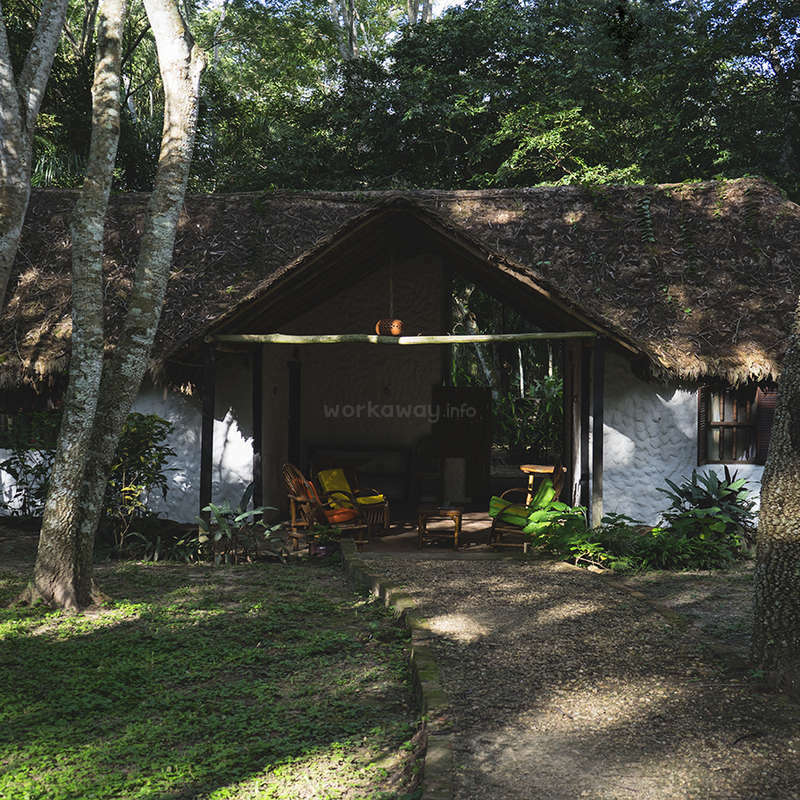 There are tasks like painting the cabins or powerwashing and cleaning that have to be done because you're living in a jungle and things get dirty, but you also have the possibility to live your creativity in other projects. We were for example cutting glasses from wine bottles or building kind of a green house. It was an amazing experience to live in the jungle - seeing monkeys nearly every day, yummy fruits, sooo many plants (and of course also ants and spiders and mold, but that's part of it :-) ). I can 100% recommend the project and miss all the great people I met. Nuestra experiencia fue sencillamente maravillosa! Estuvimos 6 semanas (originalmente eran 4) y la verdad es que nos fuimos con nostalgia porque Amanda y Beta te hacen sentir en casa. El Centro de transformación de comunidades está inserto en medio del bosque en Santa Bárbara, por lo que vimos monos, perezosos, osos hormigueros, tarántulas, tojos,… read more hicimos largas caminatas... es un ambiente ideal para cualquier amante de la naturaleza!!! Trabajamos en labores de mantenimiento, limpieza, orden y un par de proyectos artísticos, todo en un ambiente grato, amables, respetuoso. Muchas gracias Amanda, Beta, Luiz y Alfredo y a todo el grupo de voluntarios por hacer de Tekoatí un lugar maravilloso! Katja and ArturO (:D) stayed with us for a month and it is incredible how amazing these two human beings are. They were always willing to help with everything that needed to be done, even though it wasn't easy job every time. They did it and they were always shiny happy people, nice and fun :) Often they saw what needs to be done and they just… read more made it :)They helped us to finish to build aula and then they renovated old bench in beautiful piece of wood with great recycled flowerpots. We spend great mornings, lunchtimes and evening playing crazy games or chating. We spent one full month here, together with amazing people who are working on a whole range of meaningful projects to help the local communities. Participating in a few workshops has been an unique experience.… read more Initially we worked on finishing the building where these workshops are held. Afterwards we spent our working-time on our own creative project. Amanda is really flexible and promotes creativity. She is an inspiring person who knows how to run a workaway. And lovely Beta, the volunteer-coordinator, always takes care of each one and everything. Mostly we spent the evenings together. We loved sharing stories, laughs and the awesome cooking sessions! The area is mindblowing with its trails, wonderful mirador and animal diversity. We went there in July, at the beginning for 2 weeks. But this place is so magic, at the end, we stayed 1 month. Our job was to renovate the amphitheater, sanding, painting, general maintenance, and we had a really great time doing that. The organisation there is absolutely perfect, everything… read more you need to know is written on the wall. Every volunteers do their part for cooking and the food was delicious. The place is wonderful, you will never had accommodation like this again. You wake up with monkeys, we spent Sunday afternoons with slots, you can walk around the place and watch sunrise and sunset at the viewpoint. We would have spend more time there but unfortunately we had other plan. It's definitely one of the best workaway we did. Thank you a lot to Dana and Amanda for this wonderful time we had with your company. Thank you also to the others volunteers, the US and Bolivian workers to shared their time, passion and work with us. We volunteered for 9 weeks in September/October 2018 and had an amazing time. The work is hard but rewarding and you can even cool off with a dip in the newly refinished swimming pool! We met life changing friends and had experiences that we couldn't have ever imagined. 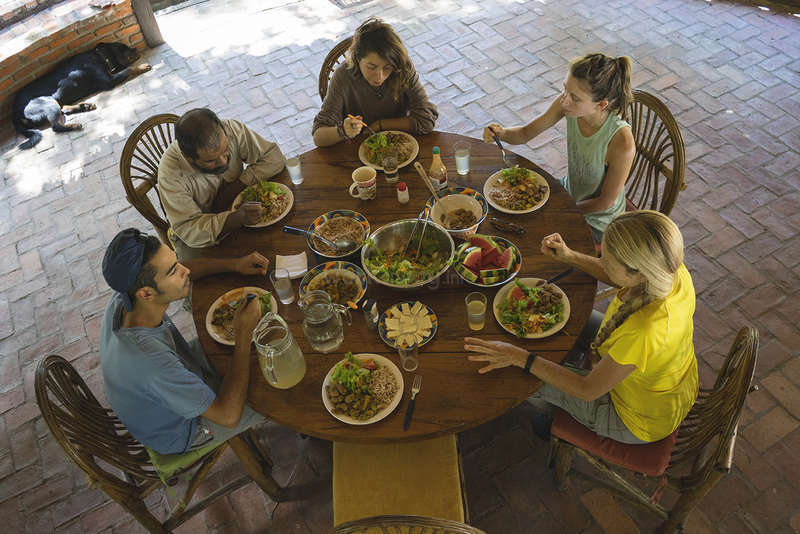 If you are going to work here you should expect to spend time living and… read more cooking with groups of 6-12 people on a regular basis and be open to helping in just about any way you can imagine. Every day is different! Nico and Elena stayed with us for two weeks and they were really hardworking volunteers willing to help with everything that was needed. They helped with our aula and general maintenance. Nico is good motorbike instructor:).They were really nice and friendly people. It was really nice to have them as a part of our community for some time. I spent a couple of weeks on this beautiful project - the place is out of this world stunning - I saw two different types of wild monkeys for the first time and endless gorgeous butterflies and wonderful leaf cutter ants. I was there to improve my permaculture knowledge and it was really interesting reading about all of the work that had been… read more done previously and all the discoveries that had been made by previous gardeners on the project - the gardening work was definitely challenging and I really enjoyed working with the other wonderful volunteers to think of ways we could grow in those conditions. The work that the ONG is doing is fantastic and it was really great being able to be part of the medicinal workshops and join the team to find out about the crucial sanitation work they are doing and to get to know the local communities. I had the most amazing time volunteering at this center and it was the highlight of my 9 month trip through Latin America. Amanda, Dana, Alfredo and Arakavi were absolutely delightful hosts and made my stay comfortable and fun. It was surreal to live and work in the Bolivian jungle for a… read more month and I was lucky enough to be there for Christmas and New Years. The diversity of work that I got up to was astounding and I loved every minute of it (except for maybe power hosing the bricks haha). From helping Alfredo maintain the senderos and bridges and dealing with wasp and termite nests, to cleaning out a creepy old toilet block where I found a sloth mother and baby, there was always something interesting to work on. Not to mention all the fun activities that Dana and Amanda organised, like making Christmas decorations, making tie dye shirts, movie nights and cooking sessions. The food was amazing and there was always plenty at every meal. Overall, I love the work that the center is doing and I hope they continue to develop and help out the local communities for many years to come. I can't recommend this workaway highly enough. I made life long friends and will never forget my experience. I will definitely be back one day. Pf! Que decir de este hermoso lugar y la magnífica gente que lo habita, estuve solo dos semanas y podría haber estado mucho más. Las actividades son muy variadas, la comida es la mejor y siempre abundante, la naturaleza y el entorno son soñados. Un lugar para volver y para recomendar, aprovechar la oportunidad de capacitarse y practicar en un… read more espacio que tiene todo a disposición para desarrollarse y contribuir. Muchísimas gracias me los llevo en el corazón! Lovely workaway! Great people, beautiful location, very organized hours of work, and lots of independence with tasks assigned. I really enjoyed learning about the organization and very much respect the work they do and more importantly how they do it. It was a pleasure to get to know everyone and share lots of laughs and great food! Thanks for… read more everything!!! Time flew by with Cheecho helping us at our Int'l Training Center. He got to work right away helping with many mid-construction projects, such as a carport, nursery roof and pool pump house. We really appreciated his conscious attitude and enthusiasm to help where it was needed, in the kitchen, construction, light cleaning, helping our staff, etc.… read more A big thanks for your willingness to be a part of the Projects and help with our green spaces as well. Very adaptable and skilled in many areas. Saludos!! If you are searching for a worthy organization or cause to help, then this group of dedicated people are most certainly worth your time. Not only will you get to live and wake up every day in the most beautiful natural surroundings, eat the most healthy , delicious food but also have the opportunity to contribute to a worthy cause for the local… read more people of Bolivia. I could not be more grateful for my time spent here or have asked for anything more. I am glad i was able to put my carpentry skills to use and build a garage for the jeep, it was really fun and had a great time building with Sean. Thank you so much Dana, Amanda, Luis , Alfredo and Penny! Helene was the delight so *️nice*️ we had her *️twice*️ :) I could not imagine a more thoughtful and well rounded individual who feels empowered and comfortable in her own skin. Her experience with children and child care shined as she plays with the cooks kids and created brilliant activities with her past experience in a large community setting.… read more The beauty of working with Helene is she is adaptable and hardworking given any task. She initially came for two weeks but ended staying four and then 6 months later an additional surprise visit before flying back to Europe. She always puts others first and is very caring and shows it in so many ways. Our director grew very touched by Helene's attitude and positivity. She helped with refinishing our wooden dining tables and filling cracks, varnishing window frames, creating a lovely tile mosaic and general tidying up. We will absouely see each other again and hopefully this time in Norway. Would give her more stars if it were an option! Una palabra para describir mi estancia aquí genial! Fue increíble. El lugar, ubicado a 9 km del pueblo de Buena Vista, es un lugar hermoso, dentro de un bosque tropical. No hay precio para levantarse todos los días y para ver en las copas de los árboles, monos, perezosos, pájaros. Al final, pasé casi 2 meses aquí y, en serio, no vi… read more pasar el tiempo. Trabajé la mayor parte del tiempo en la construcción porque me sentía más cómodo con eso, había muchas cosas que arreglar y también proyectos de renovación de edificios, pero creo que cada persona puede encontrar un trabajo de acuerdo con su conocimiento, es decir, el huerto o en otra tarea. El equipo es genial, Amanda, Dana, Alfredo y Luiz, ahora trabajan juntos en la misma línea, con una energía increíble. Estoy muy contento de trabajar para un proyecto que tiene un objetivo muy importante para mí en el país, y más con personas que tienen muchos animos y siempre piensan positivamente. Ha sido un verdadero placer. Para finalizar, este voluntariado fue una gran experiencia. Me extrañas mucho Nunca olvidaré este tiempo pasado aqui. Perdón por el retraso con los comentarios. Le doy un gran abrazo a todo el equipo, Amanda, Dana, Alfredo, Luiz. Que continúe con esta energía. What a beautiful place with amazing people, dedicated to do good! 😊 I left a month ago and still tell everyone about the memorable time I had here (even though I was sick for nearly half of my stay). Amanda is an inspiring and generous human being with all her energy invested in spreading her better-world-values and attempting to improve other people's lives. After I left, she even helped me to connect with other great iniatives across Bolivia. Popo is a fantastic human! She gels with all types of people and worked extremely long days no matter what the task was. She is a very mature and balanced individual taking on gardening, cooking, paining, cleaning and a variety of other tasks that were thrown at her. She is a genuine friend and cannot speak enough to her aura and lightness that… read more she brings to our volunteers and staff. We were fortunate to have her stay with us for 6 fun weeks. She even had great commentary for a video that we are working on and spent much of her time improving our transformation center. Pauline, I must tell you there are so many nice pool days now that the rainy season has ended. We will miss you, but know you will excel in whatever direction your heart takes you. I spent 6 weeks here and I enjoyed it a lot ! I spent most of my time gardening and painting, because there were two constructions projets going on at that time. We had one common meal for lunch where volunteers prepared and which we shared with all the workers. I liked this moment where you can learn more about Bolivia ! At night we cooked for… read more ourselves, but still try to eat together, which I enjoyed ! During my free time, I enjoyed going at the swimming pool, walking in the forest, learn new recipe such as Tofu, cuñape, sonzo etc, give English lessons to Luiz or just read in the hammock ! Amanda and Dana make it a real place of trust and for this, I felt like home :) thank you again to you, and to Alfredo and Luiz !! I wish you the best for the project ! I hope I will come back one day ! Rachel and Aroul are a dream team! They immediately got to work clearing rubbish from the yard to make more green spaces and dedicated their full energy our gardens. It is incredible the skills and knowledge they have for gardening, even in a tropical, humid, buggy climate. Two months were dedicated to improving our gardens, compost, signage and… read more nursery. When I give a new tour to our volunteers there are so many reminders of these two that have left a huge impact. Aside from their natural talents in the garden, they were very mature and pleasant to be around. VERY tidy and conscious of others energies. Rachel is great behind the camera as well. It's so nice to have beautiful photography of our daily life in here. Hope all goes well for you in Escotia and you're welcome back here ANY time. Please keep us updated and keep living our your goals! Stayed here for two months and this was without a doubt the best workaway experience we had in South America. Dana and Amanda took extremely good care of us. The jungle itself is amazing. However, be prepared for thousands of bugs and hot and humid weather. Bring mosquito repellent. Important tip: Sort out your SIM card with internet BEFORE you go… read more there. Quentin is a super trankilo volunteer with a passion for working with nature. We are fortunate to have had his assistance in our green spaces as he has a wealth of knowledge working with gardens, compost and agriculture in general. His humility makes his presence even more spectacular. Very conscience of others and his own schedule he was off and… read more running independently doing the work of two or three gardeners easily. Left to his own vices to maintain the garden and combat pests, we have so many new seedlings and saplings due to his time dedicated in the garden. Happy to report our avocado saplings have doubled in size in just two months and the llanten planted has come back to life. Quentin is patient and kind with our other volunteers, employees and animals. 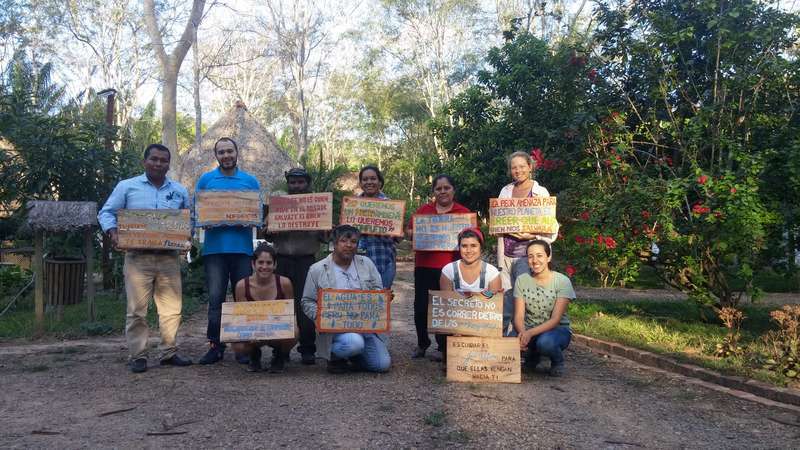 He even volunteered to give a lecture to a group of 30 campesino women from rural communities on the benefits of taking care of their land for planting to produce for future generations. Best of luck on your future endeavors and enjoy home. I' ve spent a little more than a month with Amanda, Dana, Alfredo and the volunteers. I know this is a place I'm going to miss and a workaway I would warmly recommend. Amanda and the team are working on different meaningful projects to help local communities. They are very dedicated people and their altruism is beautiful to see. Amanda is a… read more beautiful, generous person. She has dedicated her life to help others, has traveled quite a lot and has the most amazing stories to share! During my stay I was responsible for taking care of the garden, the nursery and everything that grows. I really appreciated Amanda's and Dana's trust, they let me work quite independently and at the same time were always ready to answer my questions and to support me if anything was needed. They are definitely great people to work with! It was also great to meet Alfredo, he always has some funny story to share and is a living encyclopedia of the native plants and animals. Last but not least, the place is incredibly beautiful, and you will have the opportunity to observe a seemingly endless number of mysterious plants and creatures. I hope I'll be back some day, and that meanwhile the plants, projects, and people, and Arakavi will grow well! An amazing time in a beautiful place! With forest trails, wildlife and lovely sociable spaces this is a wonderful retreat. Set in the forest near the National Park, it comes with challenges, work and fun to match! Amanda and Dana are great -they are knowledgeable, friendly and helpful and will find jobs that work for you. They work extremely hard… read more with community groups and workshops which we had the privilege of helping out with too. We did a variety of jobs during our stay - from painting and planting to weeding and watering! The gardens always need tending, trails need upkeep and building maintenance is ongoing, so as long as you are flexible this place is for you! Ju & Flor son unas voluntarias de la mejor calidad! Eran siempre alegres y bien para apoyar con todos los proyectos. Han pintado toda la cocina en un dia y media además ayudan con la jardinería y un mosaico bien bien lindo para la organización. Trabajaron hasta media noche su último dia para terminarlo, y quedo muy bonito. Nunca hace falta un bolo… read more (queque de zanahoria, bananao, o lo que sea). También compartieron todo lo que es comida brasileña -- son cocineras riquísimas. Les gozaban compartir entre todos los otros voluntarios y tocaban el ukelele y cantaban todo el rato. El único es que no podrían quedar más tiempo :) Nos encontraremos por Brasil. Buenas rutas lindas!! Empezar nuestros voluntariados fue una excelente experiencia. Pasamos 15 días espectaculares y aprendimos mucho con todo y todos. El Projects tiene un objetivo muy lindo y su trabajo con la comunidad es muy interesante. Como nos quedamos alojados en el centro de capacitación, tuvimos contacto con las personas que se dirigen directamente a la… read more comunidad y eso nos acercó y encantó mucho. Días después fuimos a una visita a una de las comunidades y fue una experiencia fantástica. Hay oportunidad de participar en los talleres y conferencias y / o de ayudar en la implementación de los baños secos, y eso hace su voluntariado increíble, creemos que todos los voluntarios deben gozar de esa oportunidad. El lugar donde quedamos alojados es impresionante. Se queda en medio de la naturaleza y usted puede ver constantemente animales como monos, aves, arañas, etc. La convivencia constante con los demás voluntarios, cocinar y compartir las comidas, trabajar y pensar colectivamente proporciona una sensación de gran familia, de vivir en comunidad y eso engrandeció nuestra vivencia . Los servicios de los voluntarios se concentran generalmente en el mantenimiento de la estructura del centro de capacitación. Diariamente hay listas que hacer y tienes la posibilidad de elegir en trabajar en algo que ya tenga aptitud o en desarrollar y aprender algo nuevo. Las tareas de limpieza se comparten entre todos igual, al igual que las comidas compartidas. La comida es abundante. Siempre hay lo que comer y cuando necesitas algo específico - comida o material para trabajo - hay mucha rapidez para la adquisición. Si usted es artista o tiene alguna habilidad en artes, ese también es un buen lugar para ejercitar. A lo largo de los días que pasamos allí, Juliana desarrolló un proyecto de mosaico con el logo y el resultado final fue increíble. En los días de descanso, o después del horario de trabajo, puedes descansar en las redes, sumergirse en la piscina, caminar por las pequeñas sendas o hacer un Yoga. El ambiente es muy propicio para ello. Hay un gran y hermoso perro llamado Arakavi y él es una fuente inagotable de energía, necesitas darle un poco de atención. Si es posible, converse también con Alfredo, un boliviano maravilloso que da más vida ese lugar. Es el tipo de persona que te encanta de inmediato. Dana, que hoy es responsable de los voluntarios, es una persona fantástica también. Siempre disponible para conversar, escuchar, ayudar, aprender y enseñar algo. Desgraciadamente no conversamos mucho con Amanda, responsable del proyecto, pero lo poco que convivimos también nos encantó mucho. Por favor, escuchen sus historias, son siempre fantásticas. Estamos agradecidas por haber pasado ese tiempo, por la atención, la ayuda y las enseñanzas. ¡Seguramente volveríamos a pasar más tiempo! Amanda, Alfredo y Dana por todo. Y, principalmente, gracias a los demás voluntarios (Anni, Hagen, Laura, Valentín, Catalina y Beatriz) que compartieron ese tiempo con nosotras. Ustedes hicieron toda la diferencia en nuestra experiencia y viaje. se van a Brasil, por favor, busquennos. ¡Será maravilloso reencontrar a todos ustedes !!!! Danny served as a wonderfully insightful and intuitive volunteer. No task was too big as he helped us tidy up the grounds while the boss was away; trimming the grass, mixing concrete for projects, replacing window screens, and helping out a ton in the kitchen. He's got a great sense of adventure and volunteerism. I appreciated the recipes shared… read more in the kitchen, conversations over wine and help taking care of the animals. The pool is in great shape and ready for your return any time. Safe travels, Danny! What can I say? For my first workaway experience I couldn't have had a more amazing time than the nearly 3 weeks spent on the projects. Before I even got there, Dana was exceptional in keeping in touch and handling a personal issue I had with patience and concern, and her friendliness and humor made the stay that much more enjoyable when I finally… read more arrived. Amanda is a very creative and caring person with a powerful vision - I hope all the cards line up the way she hopes! The work was full on - but at the end of the day, very satisfying, particularly knowing what the Centre is attempting to accomplish. There was still plenty of time to relax and enjoy a vino or a movie, or to spend a night laughing away with the other volunteers. The food was exceptional - particularly if you cooked it yourself :) There's Monkeys, sloths, and some amazing bird life to keep the naturalist happy too. I would highly recommend volunteering at this NGO, especially if you are looking for a way to be involved with the local community in a hands-on manner. Dana, Amanda, don't forget to send pictures of the Pool in use! Andre is an energic, hard-working and talented volunteer. No hesitation was shown to jump into projects and was the volunteer of choice to work with Alfredo (a huge honor). Showed a lot of loyalty and dedication to completing tasks and being part of the team environment. In his month here, we were able to accomplish a ton of projects including,… read more building two laminate roofs, fixing doors to fit in a newly tiled rooms, assisted with our electrician installing lights and sockets, and creating magical jungle potions! Thanks for being a reliable handyman and friend, sharing your music with us! No doubt you worked above and beyond what was expected of you and that shows your commitment to our little non-profit. The open road calls and hope your travels have lead you safely into Peru and beyond! Keep in touch and come back any time. Both Amanda and Dana are very accommodating and offer you a fair amount of freedom to choose the projects that most interest you. They have also worked very hard to create a welcoming and… read more relaxing atmosphere. I may have spent a month working there, but it almost felt like a beach holiday! I was lucky to get to work many, if not most days, with Alfredo, the jolly, energetic, and incredibly knowledgeable do-it-all Boliviano handyman. While there, I built roofs, fixed a motorbike, and hacked away at the jungle. Then was treated to some lovely vegetarian food, and cheap-ish wine and beer. Since I've never been a vegetarian, I was a little hesitant at first, but along with Dana and the other volunteers, we were able to experiment and have fun with it. To that extent, it was more than manageable, and no one should really have too much of an issue with it. So, if you don't like being disconnected from the internet, and if you hate being woken up by monkeys and colourful birds, then this place is not the place for you. However, if you're interested in gaining some humanitarian knowledge from Amanda, or jungle knowledge from Alfredo, all while living in a little corner of paradise, then you've found the right place! Thanks to everyone for this amazing opportunity! It made my day to read we rank among your favorite work away experience! I think it's a combination of many forces that come together to make this such a magical place. This duo took on some advanced challenges such as working with concrete, deep cleaning, painting, lettering whilst swatting away the pesky tabanos. A very… read more delightful couple who worked well in pairs and independently. Laura has a great attention to detail helping us organize the kitchen and library, while Valentin used his height to our advantage painting hard to reach places and making amazing vegan treats (tofu). It was a delight to host them and see the huge impacts they contributed to our non-profit. Great energy and volunteerism. Please come back for a community visit and to make more amazing birthday cakes. We had a wonderful time here! This experience was one of the best we've had as workawayers. There are a lot of projects going on, so it's easy to choose something you will enjoy, from general maintenance, to artwork, as well as cleaning and so on... Even though we were supposed to work 6h a day, it sometimes was more like 7h, which can seem a lot… read more but the environment makes it worth it. Amanda (the owner) and Dana (the volunteer manager) are always open to suggestions. All kinds of tools are available for your work, and if some are missing, they will gladly provide it if necessary. In our two weeks there, we unfortunately didn't have the chance to work with the communities, so make sure you can stay a little more to get the opportunity! The place is really beautiful, there are some paths to go through the forest and see the monkeys and jungle trees. Accommodation is incredible, with little cabins for everyone (shared or not, depending on how many people there is). Food is vegetarian but can be made vegan, and it's always delicious (lunch is prepared by volunteers for everyone on working time). Thank you Dana and Amanda for being attentive and such generous people, making it easy for us to work in good conditions! Dearest Anni! We were so fortunate to have you in our presence for two short weeks. One of the most hard working and mature volunteers we have hosted. Her ability adapt and take on any challenge showed her determination to help out our non-profit. She was a wonderful housemate (tolerated the creepy, crawly bugs) and is 100% self motivated. A whiz… read more in the kitchen and enjoyed her company sharing with the volunteers in the evenings. Amanda nearly held her hostage to stay as a permanent volunteer. But Anni has lots of other exciting things her in path. Always bringing a smile to our faces. Buenas rutas amiga!! PS- If the overalls fit, wear them! I loved my time here, with Amanda, Dana and all the volunteers and workers. My arrival, jobs and everything was coordinated really well and I felt included and at home straight away. The centro itself is beautiful retrait from all the noise of the cities and the dust of the carreteras. There is a work or a project for everyone, and during my stay… read more I really felt that I could help. The animals, domestic and the wild are fantastic, and I really miss the big doggie. Recommend this place 100% if you're ready to work hard and then chill in a hammock and eat well. And learn how to deal with tábanos from Alfredo. You will be taken care of, staying in a cozy cabin (with nice spider friends if you're lucky) and surrounded by the friendliest people. This is a place where you can really learn new things. For example, I felt lucky to participate in one of the capacitation courses. It was so interesting to see how the centro funcions as part of the non-profit. I miss you all, thanks for welcoming me in to your little comunity. All the best with the Project! Un abrazo fuerte! Natacha and Simon left a permanent impact on our project. Their positive attitudes, hard work and smiling faces are still talked about to this day! What most resonates from their time with us was their intuition to read into what work is needing to be done and take action before being asked. Taking on numerous projects (gardening, construction,… read more maintenance, organization, clearcutting the property) and working with our local specialists (plumbers, electricians, roofing), while preparing amazing meals and delicious homemade ketchup and marmalades. Their communication and empathy skills are outstanding. We wished they could have stayed longer and are welcome back anytime. The list goes on and on for these two but better to experience their helpful nature and see for yourself. Please come back soon! W.D. What an amazing experience! We were planning to stay there a month... and we ended up staying there 2 1/2 months and almost ended up staying there permanently. Be very careful because this project grows on you quickly and you might never leave. We feel like we're part of a bigger family. We had the chance to work with skilled bolivian workers. We… read more learned a lot about the culture, the jungle, electricity, plumbing, roofing management, etc. Thanks so much Amanda, Penny, Danna (aka W. D. = lool at the volunteer book for this epic story) for those memorable moments. Cliff fit in with our group immediately taking on challenging tasks and getting along great with fellow volunteers. He has a gift for wood working and construction taking on many projects, such as building shelving, creating a door frame, installing hardware for doors, sanding/varnishing, repairing roof beams, so on and so fourth. Cliff put in… read more many extra hours above and beyond the scheduled work day to complete jobs. Also, very talented in the kitchen and made some amazing meals for our hungry volunteers. We wished Cliff could have stayed longer, but it will take a while on two wheels to reach Canada. Hope to cross paths again soon! W.D. Thank you Penny, Amanda, Dana and W.D. and fellow workawayers for making my stay so awesome. 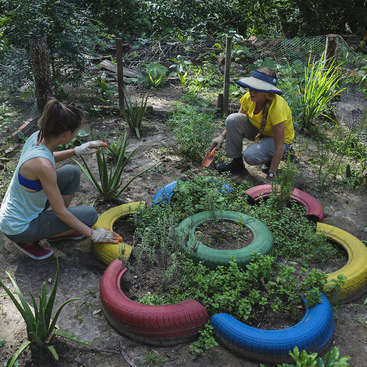 Hannah and Paul are wonderful volunteers that adapted to life in the jungle. It was a pleasure to host them and they exceeded all expectations for working and playing hard. Hannah has great attention to detail and was very nurturing taking excellent care of our common spaces (kitchen, bathroom, comedor, aula, etc) and took any challenge with a… read more smile on her face. She helped label and organize many areas that were lacking care and took pride in all of her tasks. Paul shines in any area of expertise as well. He was a master at helping us clean out our water canals, repair wooden tables, build a sink basin with bricks and concrete, and bake excellent chocolate cakes. Not to mention he was the first to race to the sink to help clean up after a meal. Hannah and Paul offer a variety of skill sets and can adapt to any environment given the extreme jungle conditions we live in at times. We miss their daily tea time and modeling the latest jungle fashions. Best of luck - come back any time! We had a private room which was comfortable, spacious and surprisingly 'un-buggy'! There was also a toilet and hot shower right opposite, which was great. Raphael es un voluntario maravilloso, tan trabajador, puntual, con mucha experiencia y talento en construccion, carpinteria, y jardineria. Rafa tiene una energía muy positiva, siempre con una sonrisa, y listo para realizar cualquier tarea y aprender de todo. Es una persona muy amigable, participa con el grupo, en la cocina, con la limpieza, y… read more también compartiendo espacios sociales. Es muy genial, quisiera que vuelva para pasar mas tiempo aca! Mi estadía fue una gran experiencia. El lugar está ubicado en un bosque tropical y hay dos senderos ecológicos para explorar la naturaleza. Los habitaciones son muy cómodos - espaciosos habitaciones privados con baños compartidos. Amanda (la anfitriona) es una persona muy amable y ayudaba con todos asuntos y problemas (por ejemplo, me ayudó de… read more reservar un ticket para volar de Santa Cruz a Sucre). Amanda siempre estaba abierto por nuevas ideas y sugerencias. El trabajo fue divertido (aunque duro a vezes) y yo trabajaba en la construcción de un canal de drenaje, una extensión de un pared, y los muros para un lavamanos. El lugar significa vivir y trabajar juntos y fue bueno de cocinar, hablar, y pasar el tiempo con los otros 4 voluntarios que fueron muy buena gente. También, fue lindo de interaccionar con los trabajadores locales que me ensañaban mucho sobre el estilo de vida boliviana. En suma, me encantaba mi tiempo y puedo recommendar este workaway a todos (si no tienes miedo de arañas :-). Merle and Arthur are a fabulous volunteer couple. Always smiling, energetic, ready for any adventure of the day! I was thrilled and astonished by their willingness to work hard, play hard, get involved in any needed task at a moment's notice, and join the team in cooking, cleaning, and weaving our tapestry of volunteer work and creating community.… read more I truly appreciate their beautiful harmony and endless positive energy. Thank you and may you continue thriving along your traveling path, wherever it may take you! What an incredible experience we had here! From the first moment we met Amanda and she took us from the village of Buena Vista to the site with her mighty red jeep over those jungle roads, trying to save the eggs she had just bought from the market, picking up papaya from a tree fallen down and talking wisely and passionately about whatever… read more subjects came up, we knew that we had come to the right place in our search of the true core of Workaway! Our little over two weeks there were packed with constant ways of learning new skills, discovering the jungle (its flora and fauna) and reflecting on ideas about projects, Bolivia and life in this so diverse world in general. There truly is the perfect balance between what you have to offer to the project and what needs to be done with a gentle touch of positivity and encouragement from Amanda to go beyond what you think you can achieve! Every day you wake up to the sounds of the jungle and have your breakfast with other volunteers in the beautiful open space kitchen before you start working on the project most desirable from the well organised board (that gets tasks added to regularly). The lunch is always enjoyed together, so volunteers, Amanda and Alfredo (or also the guests that might be visiting) can take an hour or two to sit down as a family. Those lunches just fly by with conversations that leave you with new insights about always interesting topics! It's up to you if you wish to spend the dinner the same way, but we highly recommend you did! There will always be plenty of spare time to enjoy a cold beer, go for a walk on one of the treks, jump in the pool, read a book on a hammock etc as the property is big enough for everyone to have their space and peace of mind during their stay. Everyone has their own cosy cabin, you can have your own room or share, whatever fits you better. The food is local, healthy and there is plenty of it! We will be forever grateful to Amanda for our experience - she truly is a unique person with so much knowledge, sincerity, encouragement and innovative ideas! We miss her and Arakavi already and hope that one day our paths will cross again! We stayed here for 2 weeks and it was our very first Workaway. Amanda was there right from the start to help us through and guide us when needed. She was always flexible and truly cares that you learn and have a good volunteer experience. We had the chance to do whatever tasks interested us and learn new things in the process. I planned, created… read more and planted a small vegetable garden together with another volunteer which was a fantastic and rewarding experience! Jorge worked with Alfredo on various maintenance tasks and got to work on the eco paths in the jungle for 2 days! Amanda is incredibly generous and there was always more than enough veggie food available for us to cook and we ate so healthily! Charlie and Holly are a dream duo. Their smiling faces, enthusiasm for every task, willingness to work hard on multiple projects , their love of cooking delicious, healthy food, and engaging conversation made them a perfect pair of volunteers. I miss you two! Even when ill, they made a big effort to be part of the team and never complain. Come… read more back ANYTIME!!! The project: You are not just helping out on an individuals private land, you are contributing to the training site of an amazing NGO that is involved in a whole range of interesting projects across the region. If you have… read more specific skills in a certain area eg medicine, mechanics, biology, farming then let Amanda know and who knows where it will take you. The site: amazing kitchen with a huge range of food, equipment and spices. The cabins are all comfortable and spaced out making it really peaceful. There a loads of trails around the huge area which wind through rainforest, up and down and there's even a great mirador. Outside the project: Buena vista is lovely little village with a charming plaza, somewhere to buy swiss cheese and four restaurants with WiFi and Amanda squeezed us all in to go and visit. She heads into the village every few days and pick up general and personal items (the fridge is stocked with beers with a money jar so don't worry about that). She also organised a camping trip for us to Amboro park (much cheaper than a tour) but the rain was too much. She took us all to a chocolate fiesta in a nearby town which was awesome as well. Stefi and Mark were wonderful volunteers, always ready to work hard, learn a new skill, and implement their knowledge of gardening and carpentry. Their flexibility and versatility worked well here, where the jungle environment is full of surprises. I really appreciated their positive attitude, friendliness, and teamwork. Thank you! 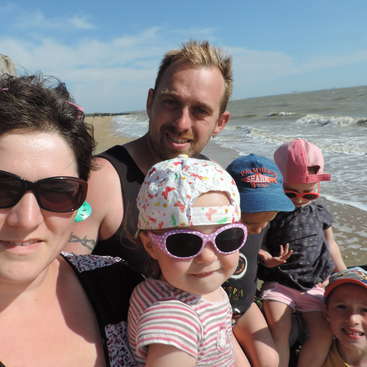 We can totally recommend amandas workaway Place! Its an Amazing Opportunity to enjoy the life in a Jungle area and to work for a really Useful project. 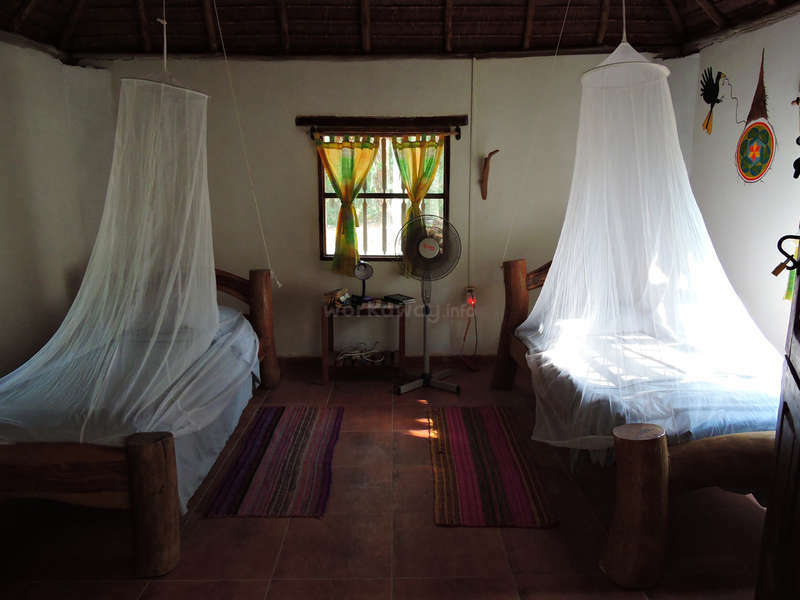 You will sleep in Nice cabanas with a mosquito net ;) you always have free Access to the Kitchen and a lot of Healty Food is always available. We enjoyed the Cooking and Eating with the Whole Group… read more and amanda and Alfredo. We always had interesting Diskussions and amanda told su a lot about her Project and her travellings, so we geht inspired too! You will work around the area and do Different Tasks, like gardening, painting, cleaning, carpentry, etc. we really enjoyed Raising the bed. Garden and a herb Spiral! We could Share our Own Ideas, this was Great! The areas is really beautiful, you can see a lot of animals like monkeys, sloths and butterfly's and you have the opportunity to visit the Amboro park, when it's not raining to heavy ;) Thank you Amanda for the great time! I truest understood the power of workaway when working for Amanda and Penny. This was my second workaway and if I hadn't found it so late in my travels I would have stayed longer :) I really enjoyed the relaxed environment as well as the good company. I met many amazing people and shared many great stories. The food was delicious and I'm so… read more grateful for filling my belly with so much veg! Looking forward to coming back some day! I really appreciated Gaetano's enthusiasm, hard work, positive attitude, and willingness to cook delicious meals for our crew of volunteers. He was keen to try any task, learning how to use the weed whacker and how to lay bricks, how to cut down palm leaves with a machete to create a "driveway" to get the truck out of the mud! He never complained… read more and always worked with a smile. Come back anytime! I had an amazing experience working here for 12 days! Amanda and Penny are two busy and super interesting women, always ready to help and to share their stories with great passion. The place is a relaxing corner of paradise (even for the mosquitos) and the accomodation was very comfortable. There is every sort of work going on, from brick laying… read more to power washing, from varnishing to rescuing trucks stuck in the mud ;-) I was also lucky to be there when they had a training week and so I got the chance to meet the nice hosts who came by. Thank you for the lovely time and good luck with your projects! 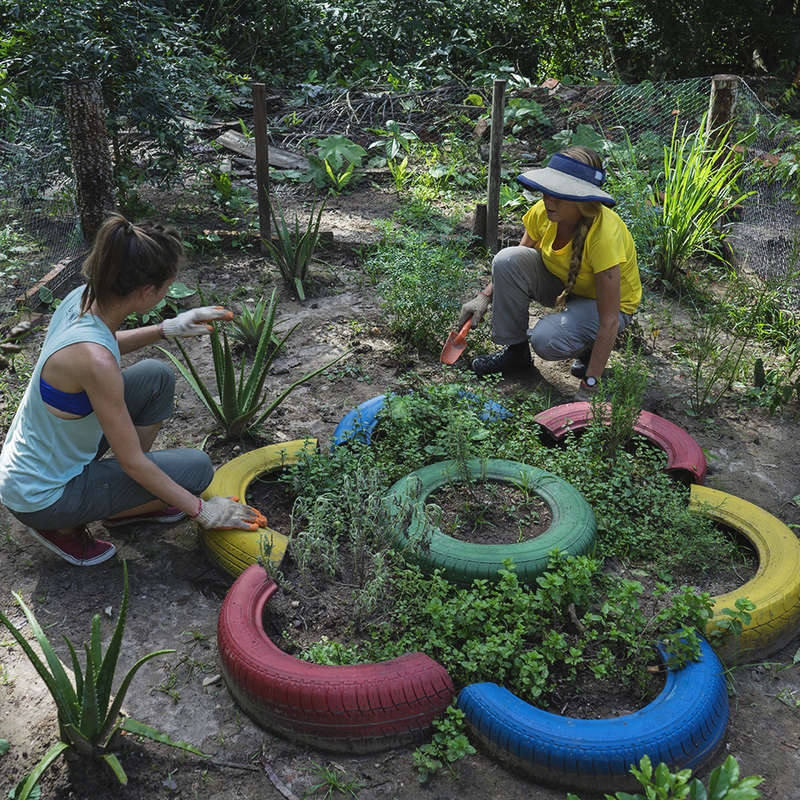 If you are looking to help with an impactful and meaningful project in a relaxing and beautiful jungle setting, you should make the trip here! Amanda is one of the most dedicated individuals i have met. She was a welcoming host, that taught me about Bolivia, always communicated clearly. I was excited to work on painting, trail maintanence, and… read more building paths at this training center. I really enjoyed time spent working with Alfredo - he is constantly happy and positive person that knows the jungle very well. We also had the opportunity to visit and interact with nearby partner communicates which was a rare look into life into remote villages near Parque Amboro. Cooking meals together with Amanda and other volunteers from the US and Spain was always an enjoyable experience as well. Of course, after a hard days of work on hot days, a cerveza or two were obligatory ;). I would really enjoy returning in the future to see the progression of this project. Preston was an amazing volunteer! So hardworking, determined, and with a wonderful attitude, always with a beautiful smile and positive energy. I thoroughly enjoyed his company and work during his stay here. He enthusiastically volunteered to work on any project, whether trail maintenance, cleaning out rain gutters, digging ditches, painting… read more cabins, cooking for the group, cleaning, or any other task. Come back anytime!!! With Marisa, I look forward to meeting her! Jules was an amazing volunteer! So hardworking, willing to try anything, learn new skills, and take on any task at hand. And, she is an amazing cook! She brought the volunteers together with her food and friendly attitude, allowing me to take a break to escape and get some computer work done. Alfredo, the caretaker, remembers her every day,… read more wishing she would return... so do I! Our experience here was amazing. The facilities are just perfect, great kitchen, private room, no hot water, but not needed in the heat. It s near one of the cutest village I ve seen in my 9 month trip in South Am. The wildlife is amazing and Alfredo is there most of the days to teach all he knows as a former National park employee. Truly mind… read more blowing. Amanda the host is very helpful, she provides for great food and conversation. The work is very diverse, but as it s a new humanitarian project their is lots to do. Some days might need more than 4 hours work, but if you are tired by heat or bugs Amanda is understanding and open to discussion. We would be please to come back one day, and wish Amanda, Arakavi and Alfredo good. Ana y Diego son una maravilla de pareja. Me encanto trabajar con ellos aca. Diego es ingeniero electrico, y le encanta trabajar. Es genial, tranquilo, muy trabajador, y un mago para solucionar problemas tecnicos de cualquier aparato o sistema! Ana ya es una buena amiga, la extrano mucho. Es muy trabajadora, sin parar, sin quejar. Se anima para… read more hacer cualquier trabajo, aprender cosas nuevas, y se inspira con la naturaleza (los monos!). Es enfermera y apoyo cuando otros se enfermaban, y con nuestro taller de salud. Espero que vuelvan pronto, amigos queridos! Nuestra experiencia en fue espectacular. Mucho más que un workaway, para nosotros un antes y un después en este viaje. El trabajo, tan diverso, que hay para todos y todas. Además, Amanda es una persona muy flexible que te permite elegir tus horarios, de hecho, nosotros no nos fijábamos en las horas de trabajo, ya que el lugar te invita a seguir… read more haciendo cosas y el tiempo pasa volando. Tuvimos el privilegio de visitar dos comunidades donde Projects trabaja y acercarnos a la realidad que viven en Bolivia, lo cual nos hizo motivarnos más y en querer ayudar al máximo. Los dormitorios, bien equipados, con ventilador, mantas si necesitas, mosquiteras, para nosotros, perfecto. También, es un lugar para desconectar del día a día. No internet, no coches, no tele. A cambio, el canto de los tucanes, monos capuchinos comiendo entre los árboles, monos aviadores aullando al amanecer, osos perezosos colgados en los árboles y otros animales y como no Aricabi, el súper perro muy carinhoso siempre listo para jugar. La sintonía con los otros voluntarios fue espectacular, sin importar su procedencia o edad, todos con buen ánimo de aportar lo mejor de si mismos. Esperamos volver a coincidir más adelante. Angie is incredibly creative, supportive, and hardworking. She sees what needs done, and jumps right in, rolling up her sleeves to get the task accomplished. She knows how to do many things, and doesn't hesitate to learn new skills. Her inspiring rainbow colored mural, on the theme of water, is a topic of conversation for all who visit. Thank you,… read more Angie! This is the most beautiful little place, a proper piece of paradise! It comes with lots of bugs and humidity but it was certainly worth it! The work: there were so many different projects! A huge variety to choose from, from gardening to painting to cooking, as well as many opportunities to get creative. I made so many… read more arts and crafts things and Amanda let me paint a huge mural even though I had never done one before! The host: Amanda is someone I now call a good friend ♡ a very empathetic, helpful and motivated person, I am convinced she is wonderwoman :) if you ever need anything she sorts it out in rapid speed, she is very forward thinking and productive, a pleasure to work with. In all, this is a one in a million place definitely worth experiencing! Steph and Renaud were the perfect volunteers! Their skill sets (engineers who can do just about anything, with few resources! ), tenacity, enthusiasm, determination, and self motivation are outstanding. I thoroughly enjoyed their company for two weeks, and wish they could stay two months... or more! They love animals and are very responsible… read more guests. I am so lucky to have had them here to help out with the electrical system, and much more! They even got the pool running for me, just in time for a village health promoter workshop on saving people from drowning! We had a great experience here. There is so much diverse work to do, for every skill set, one is never bored! The site is very spacious and surrounded by jungle, a very relaxing environment (now complete with a pool!). In our free time, there are many walks to do, including some in amboro park on weekends. Otherwise just chilling in hammacks,… read more reading, playing with the dog, or movie nights! Its very easy to get by without internet! We made our own food in the spacious kitchen, all supplies paid for. Amanda is a very interesting and busy person doing great work fo the local communities, making the volunteers work all the more meaningful. We wish we could have stayed longer! Emilie is a delightful person, hardworking, dedicated, and enjoys new experiences! She has a calm, positive energy, and works well in a group as well as alone. She helped paint our eco-cabins and move construction materials. She is well organized. Wonderful experience having her here for 10 days, in Buena Vista, Bolivia! Amanda speaks spanish and english, so it was very helpful for me because i'm french, and i didn't understand, she took the time to speak slowly or to traduce me some discussions. I recommend this workaway! 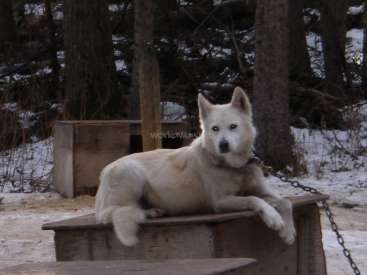 Volunteer looking after dogs in Alberta, Canada.